A dark blue ink made in a limited quantity by a respected manufacturer for a pen retailer - why don't you go ahead and take my first born child while you are at it? All of my buttons were pushed with Cult Pens Deep Dark Blue, a limited run ink made by Diamine. For something this cool I was more than happy to get it shipped across the pond to my doorstep. In my quest to try every blue ink on the planet (not really - it just seems that way looking at my ink shelf), I have discovered that I enjoy darker blues and blue blacks more than the lighter shades. I also don't like blues that are too black or show too much green. And you guys thought I was picky about my pens! Deep Dark Blue nails everything I am looking for in a blue ink. Deep and dark truly describes the color but when looking at it on the page you can clearly tell it is blue, and that is key. When it dries you can even see hints of grey and purple. There is minimal shading with my TWSBI 1.5 mm stub but otherwise the ink performed well with no feathering or bleed on my Rhodia DotPad. The dry time was right in the middle of the range of inks I've tested, maybe even on the quicker side. Overall, I am very happy with this ink and can see having it in my daily rotation. It reminds me a lot of De Atrementis Benjamin Franklin, which I used in my Tomoe River Paper review. I'm glad I picked up two bottles up front, along with two bottles of another ink not available in the US which I will be reviewing soon. I'm such a tease. 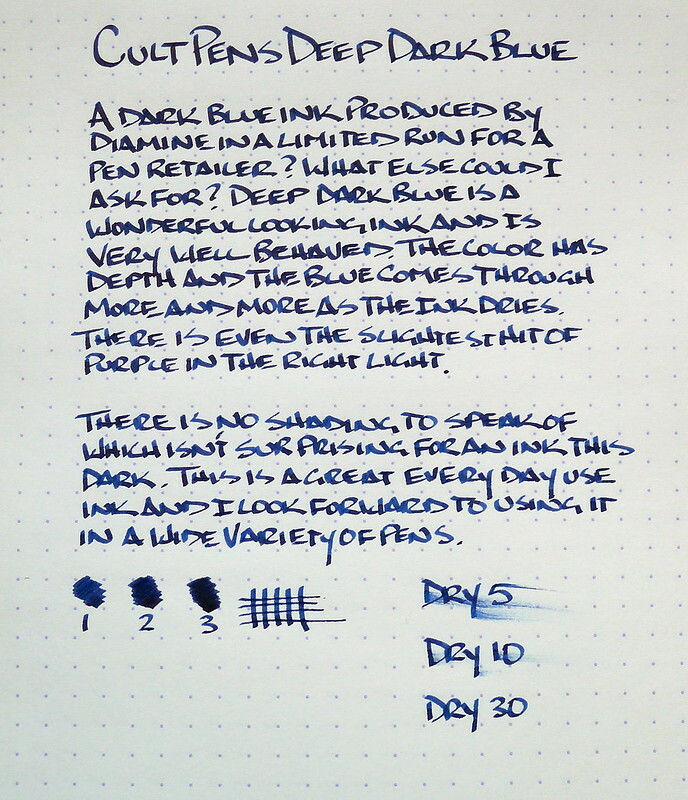 Posted on June 17, 2013 by Brad Dowdy and filed under Ink Reviews, Diamine.